"The cause for enlarged canine spleen can be from many disorders. Diagnosis can be tricky, and prognosis will vary depending on the cause." The cause of enlarged canine spleen is cancer in 7% of cases (called hemangiosarcoma). Other causes that are not cancerous include nodular hyperplasia (a benign tumor), when dogs are anesthetized, in stressful situations, when blood parasites are present, or if there is bruising (hematomas) affecting the spleen. If the enlargement is caused by cancer it develops in the lining of the blood vessels. Since this cancer is connected to blood vessels it rapidly spreads throughout the body to other blood carrying organs such as the heart and perecardium. Your dog may be in pain from a large canine spleenic tumor. Some veterinarians believe that the tumor might pull on the internal ligaments. Your dog may show a lack of appetite or refuse to lay down. Diagnosis of enlarged canine spleen can be tricky since lab results can be influenced by the section of spleen removed for lab tests. Since there are causes of tumors other than cancer, your veterinarian might mistakenly remove an area that is not affected even though cancer exists in other sections of the spleen. 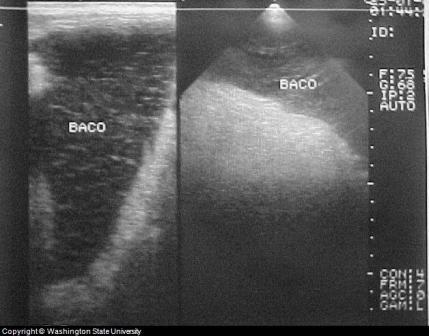 Ultra-sound examination of Weimaraner showed enlarged dog spleen with typical ischemic lesions (coarse-lazy). Successful surgery demonstrated a very big spleen in a double-torsion fashion. Your veterinarian will most likely want to do a canine spleenectomy (removal of the spleen) to remove the tumors. Dogs tend to recover well several days after surgery to determine the cause for enlarged spleen or tumor removal if the tumor is not cancerous. If the tumor is cancerous, the prognosis is not good with some dogs only surviving for 6 to 8 weeks. Chemotherapy has been shown to help in some cases after surgery.